The JDC Archives are organized within hierarchical collections. Each collection informs the structure of our archives database. Watch the video tutorial below or scroll down for FAQ-style help and tips for using our text collections online. For a transcript of this video with screenshots, click here. 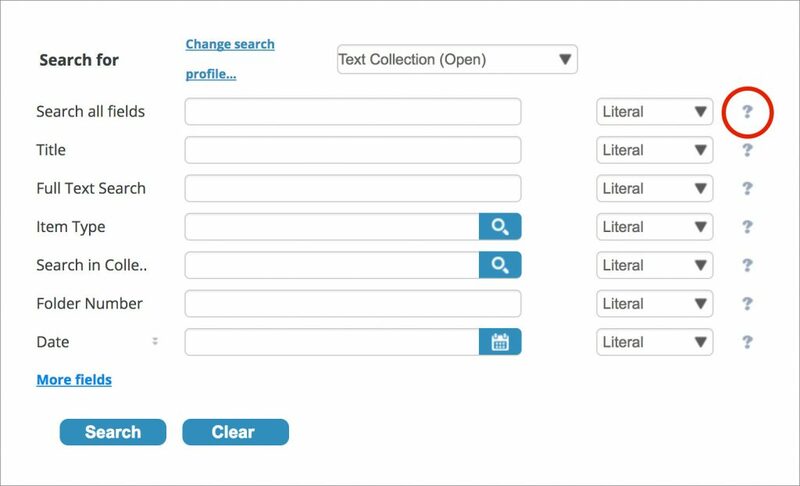 Advanced Search will search specific fields for our text collections. Click on the question marks (?) when you want instructions on a field. Is it possible to search across collections? Yes, use either Quick Search or the Advanced Search fields: Search all fields, Title, Full-Text, Date and/or Subject Terms. How do I sort search results into “original order”? Copy / paste the folder title of interest into the “In Folder” search field. On the results page, set the “Sorted by” drop-down menu (on the top right) to “Item ID = Asc”, which will organize the results in the original order. How should I optimize my searches? Please consult our Finding Aids for more information on the topical areas covered in our collections. This background will help you construct searches. How do Literal and Fuzzy search options work? Located next to all search fields, Literal returns results that exactly match the entered search terms. Fuzzy accounts for spelling variations and/or errors. Therefore, selecting fuzzy will broaden your search. For a better result use fuzzy search when using the “Full Text” field. Can I search the full-text of digitized documents? Yes, use the Advanced Search field labeled, “Full-Text”. Is it possible to search within only one collection? Yes, use the Advanced Search field, “Search in Collection”. How do I use “Hierarchical Browsing” option? 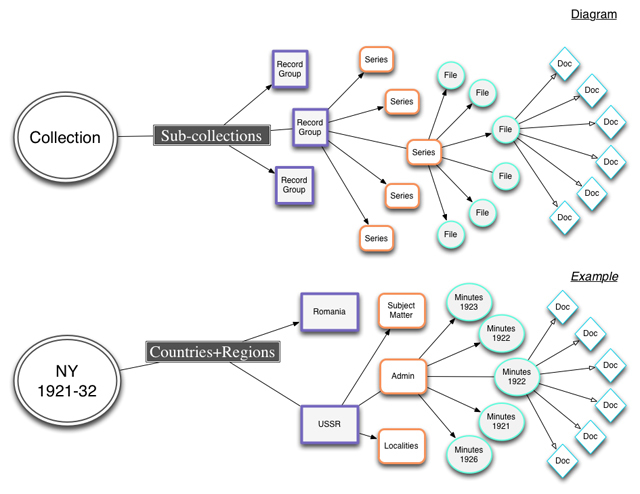 Hierarchical Browsing is a dynamic way to browse the whole hierarchy of a collection. It functions like a tree or outline view, which allows each item to be expanded to reveal sub-items and collapsed to hide sub-items. Be warned, this feature is slow to load. How can I see all documents by a specific author? Once you are in a Document level record, you can see all other documents by the same author by clicking on the “Similar Items” link. Can I browse by subject? Yes, though mainly within File level records, which include a list of subjects. Clicking on one of the subject terms will get you a list of files that have the same subject. How do I browse the contents contained within a record? Use the “Look Inside” tab found along the top of all record types to see all items or other records connected to that record or folder. How do I browse within Sub-collection, Record Group and/or Series records? 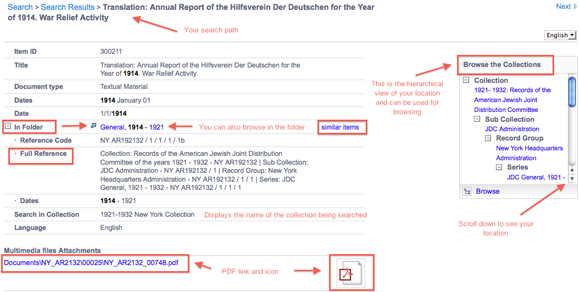 Use the “Browse the Collections” window within these record types (on the right side) to link to any level in the hierarchy above your current location. How do I browse within File/Folder records? From a file/folder level record, you can browse the contents of a file by either clicking on the “Look Inside” tab, or by clicking on the “Similar Items” link in the “Found In” field. You can also use the “Browse the Collections” window to link to any level in the hierarchy above your current location. How do I browse within Document records? From a document level record, you can browse the other documents in the same file/folder by either clicking on the folder title link, or by clicking on the “Similar Items” link within the “In Folder” field. How do I access and view documents digitally? Digital documents can be accessed in our database, within Document records (also see the hierarchy diagram). Within these records are links that will download a PDF to your computer. The database does not save searches. How should I save my research so I can retrieve items at a later date? There are two ways to record the location of items in a reliable way, so that they can be found later. What format should I use to cite the JDC Archives? Our preferred citation: Repository, Title of Collection, Folder number, Title of item, Date of item. Example: JDC Archives, Records of the New York office of the American Jewish Joint Distribution Committee, 1914-1918, Folder #143.3, Cablegram from Albert Lucas to Ambassador Francis, 08/07/1917. How can I access collections that are not yet digitized? We welcome researchers. You can Request Information, Contact Us or email us at archives@jdc.org. If you are interested in visiting, please Schedule a Visit through our online application. I am new to archival research: where can I learn the basics? The Society of American Archivists has published Using Archives: A Guide To Effective Research to address the basics of accessing historic materials in archives. Where can I learn more about JDC Archives? Please view About the Archives, in which the FAQ section will address some basic questions regarding JDC Archives. What does the hierarchy look like? Below is a diagram and example outlining our hierarchy. How does the hierarchy relate to the JDC Archives database? The database is made up of records describing items and their location within each collection. Most collections have the following set of record types as the hierarchy: (1) Collection (2) Sub-Collection (3) Record Group (4) Series [if any exist] (5) File/Folder (6) Document. Can I see where my search result is located within the hierarchy? Yes, when you select a search result, it will include both a “Browse the Collections” widget, which provides an outline view of the collection and your location within it, and the “Full Reference” field describing your location. Which text collections are available digitally? We are continually importing new digitized text collections. Please visit our Finding Aids page for currently available collections. Additionally, if there is a specific question you have regarding our collections, please contact us. How does the JDC Archives digitize text documents? We digitize text documents from microfilm reels, which is why our digital images are in black and white. We also digitize at the document level rather than the folder level, so you can access each document individually. We have digitized 2.7 million pages and regularly add to our database as collections are digitized.